While the arrival of cloud accounting products means that many of the existing products have migrated from PC, there has always been a demand for an accounting product for Mac users. As far as I know EasyBooks is the only dedicated accounting product for Mac users and accessible via an App on iPad, iPod and iPhone too. The layout is simple and intuituve, each selection bringing up the data and input to the right. The concept is slightly different to that expected by accountants and bookkeepers used to the more traditional models. The first “Accounts” section covers the nominal, customer and supplier accounts with a statement function which covers the usual customer/supplier statements, and is also used for bank reconciliation. Data entry is made by selecting the account the transaction is to come from (eg a bank account) and adding a new transaction which also directs the expense to the relevant category. There is not the usual journal entry the accountant might expect but depreciation is entered by making an entry from the asset account to the depreciation expense account. The same process would be used for recording corporation tax and hire purchase interest, and there are also options to “make recurring” entries using the + button. While making the entries there are helpful prompts, and access to help from the ? button. 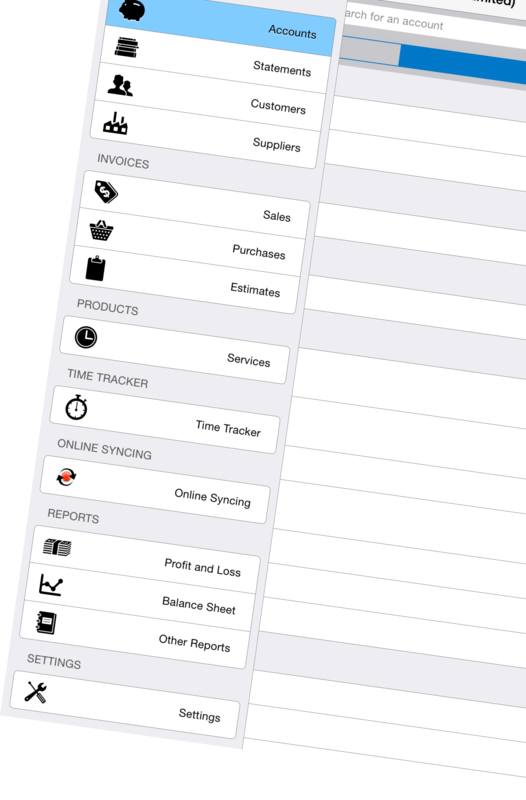 The invoices section covers both sales and purchase invoices, simply adding invoices and categorising accordingly. Payments can be made directly to the invoices listed by clicking on the relevant one. The reports options are the most familiar to traditional users with standard layouts, and the ability to add comparatives and amend start and end dates. There are certainly other reports which would be useful such as a month by month grid which is a personal favourite, but the selection available will be welcomed by business users. VAT reporting is simple and transparent with a clearly visible adjustment for cash accounting users to remove unpaid invoices from the report.